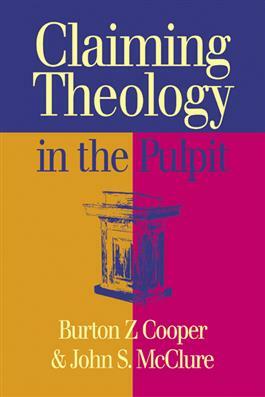 Encapsulati ng years of experience integrating critical theological thinking with the preaching task, Claiming Theology in the Pulpit will be a welcomed resource to both preachers and students. Through the use of a theological profile, Burton Cooper and John McClure help preachers become more aware of not only the broad theological traditions of the church but of their own particular theological appropriations. Part One lays out the eight categories of the theological profile, offering a worksheet for readers to identify in summary fashion their own theological position. Part Two suggests specific ways that preachers can use the profile as a tool to become more theologically intentional in their preaching.